19.000 lbs (8500kg) shear to cut tons of steel in a blink of an eye! Cleveland based division delivers mobile hydraulic shear. 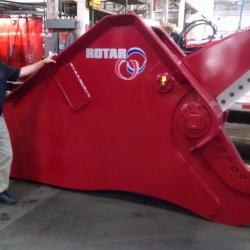 The 19.000 lbs (8500kg) weighing Rotar RSS 100 is armed with a in-house developed hydraulic cylinder. The cylinder with integrated speedvalve ensures fast cycletimes and powerfull cuts. The fully encapsulating noseblades, strong rotating subhead, long lasting swivel and double hose connections are key features of the RSS-series. The double hose connection on the swivel and large diameter of hoses, bores and pipes create optimal oil flow. This counters heat build-up in the hydraulic system, reducing the carriers fuel consumption and increasing your business result. All RSS-series mobile shears are manufactured out of high-grade Strenx (former Weldox) steel. The Rotar RSS-series gives you the competitive edge! 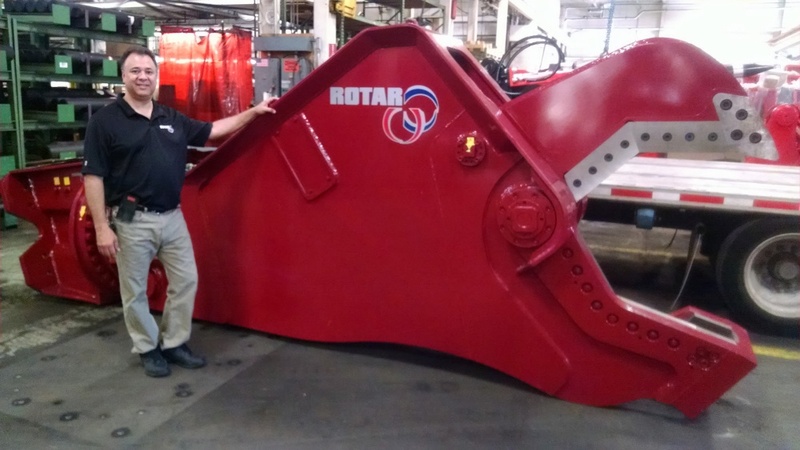 Rotar North America, Inc. is based in Cleveland, Ohio and is the US and CA source for Rotar’s in-house developed and manufactured, full line of heavy duty demolition attachments. The range includes mobile hydraulic shears, pulverizers, demolition shears and material handling grapples. 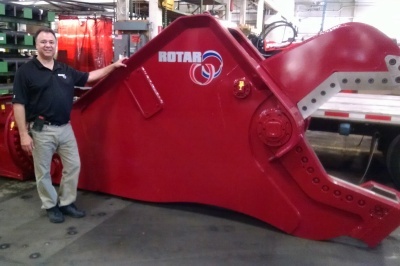 On the photo; Salvatore LaCorte, Sales Director - Rotar North America, Inc.